We're currently going through some tough patches right now..
Last night, I attended my regular Yoga class. What made it different was that it was my first Yoga class in 5 days. Yes, I was on a break - I got caught up on some stuffs thus, I decided to take a break. It was kinda hard, but not as hard as I expected it to be. I thought that I would be struggling all throughout the 90-minute session, but good thing - I only struggled on some parts. Try it for a change!! Bond, James Bond. This line has been so familiar to us, it transcends generations and years - everyone knows James Bond. I've never been a fan of the James Bond franchise, it was my Panget who's a big fan. I remember fondly, while studying in Beijing - my friends and I had our weekly DVD shopping spree, and suddenly I found a complete set of the James Bond films - from Sean Connery, to Roger Moore, to Timothy Dalton, to Pierce Brosnan (did I miss anyone?) They had all the titles, what's worse was - they were being sold - irritatingly cheap! I was reluctant at first to purchase the whole thing, so I sent my Panget text message asking if he would like the whole set - as you may have guessed - he did. And so I proceeded and purchased the whole set. I don't remember the exact number of titles - but it was plenty! When I got back from Beijing - the first DVD that we watched together was a Sean Connery - James Bond flick. I kept on laughing because there were no sound effects, the action sequence was hilarious and it was obvious that James Bond wasn't hitting as hard! The names of the female cast were out of this world!! It was just then that I realized that Austin Powers saga was the comedy version of the original James Bond flicks. I must give thanks to the whole James Bond phenomena - well, he made me love and appreciate Austin Powers even more! Yeah baby! I first saw Daniel Craig in Munich. He was really good there, and while watching - I couldn't believe he would be the next Bond. Somehow seeing him in bell bottoms didn't really help my imagination. But I swore to give him the benefit, that he would be able to portray the character well. He was picked out of so many candidates (I was partial to Clive Owen - but he doesn't look polished enough to be James Bond). He must posses something for the people behind the Bond franchise pick him, he must be good. A few weeks before the actual showing in our local cinemas - my brother already told me that the movie has been getting good reviews. Apparently, Daniel Craig is bagay to be James Bond. Then on the week that it was showed, my brother confirmed to me that indeed - he was the perfect choice. This good review made me super eager to watch it. And the only time that my Panget and I had, was last Friday night. I was so excited to finally have the chance to watch it and since there has been a Poker craze for the past year - the movie became more interesting. BTW - the theme song is also super!! :) Can't you see that I was literally SOLD on the film? I was bowled over. Literally. Yesterday was an event filled day, I witnessed a burning luxury van in Murphy Cubao, went to look at the Corelle sale at Eastwood, check out The Block in SM North Edsa, shopped in a hurry in Gateway Mall in Cubao, literally walked through Aurora Boulevard in Cubao, ate delicious steak at New Manila, had my pedicure in Posh Nails, and finally had foot massage at Footloose in Tomas Morato. All these I did from 2:00 in the afternoon till about 11:45 in the evening. Let's a have an actual run down, shall we? I left the office at around 2:00pm to accompany my mom to the Corelle and Pyrex sale at Eastwood in Libis. 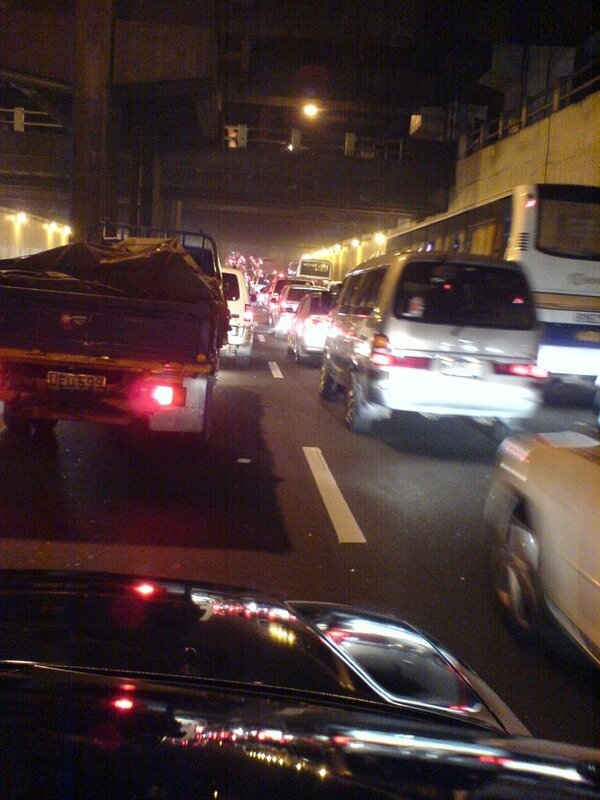 On the way there, near Camp Aguinaldo - we were met by heavy traffic. The driver told us that there was a fire somewhere because he could see black smoke. The weird thing was that it looked like it was coming from the street and not inside the camp! When we got closer - we saw that it was a luxury van, the ones like celebrities used! It was burning like crazy and dark black smoke and red orange flames can me seen. People, who were curious went on ahead to take a look. Because of the van burning - we were forced to take a turn in some street, we circled and circled until we reached Katipunan Avenue - thank goodness! Then we went on ahead to Eastwood City. We found it quite weird that the sale was on the 7th Floor of the Cybermall building. Upon stepping foot on the 7th Floor - there were signs that led to the sale itself. The office space looked awkward - it was an empty office space that was not even fixed. There were no tiles on the floor, and one of the pipes had a leak! Nevertheless, it didn't stop us from looking at the sale. We were disappointed again, as usual! The items that we saw now, were the same items that we saw a few months back - they were still on sale! Sigh - disappointed once again, but we bought extra measuring cups - because they were on sale and a set of bowls - because my mom had this thing with white bowls! Hehe..
We then went on to check out The Block - the newest annex of SM City North Edsa. I was looking for champagne colored shoes for my cousin's wedding - since the mall was suggested by the sister of my Panget - we went there to take a look. The mall was quite big and impressive because of the vast spaces right smack in the middle of the mall. It looked like I was in a mall of some Asian country! But as we went up the floors - the set-up was quite weird! The shops' location were not as accessible, you had to go around the mall (literally because of the floor plan) and circle it to see the shops. I was thinking - what were the vast open empty spaces for? Maybe for events? Oh well, I was already getting lost! As I searched for shoe stores, I couldn't find any that caught my fancy! Why is it that whenever you are searching for something - it always is not around or available? I decided to go to the main mall to look at the local shoe stores, maybe I can find a pair that I liked. First stop was Celine. As I entered, I searched and searched for the formal shoe rack - and when I did, I looked at the display racks from the bottom up - then as I reached eye-level, a sparkly sandal caught my eye. I immediately grabbed it, showed it to my mom and tried it on then BOOM! It looked fantastic on my feet! Finally! I found the shoe! Take note that, the search was done in less than an hour! When I asked for my size, the saleslady was kind of dilly dallying - for whatever reason - I don't really know, when she gave me the pair with my size - there were blue ballpen marks on the shoe! It was damaged! Argh!! When I asked the manager to look for a store near the area which carried my size, she apologized and told me that branches have different style stocks! I asked her again, nicely if she could help me look for a pair - and she did. She found pairs available in Megamall and in Gateway. Since Gateway Mall in Cubao was the nearest to where I was - I had it reserved. On the way home, my mom asked me when I was going to get the shoes. I told her tomorrow (which is today) because I was already kind of tamad to go and get it. She then told me that my aunt (whose daughter is getting married tomorrow) is borrowing the driver, thus - I had to get the shoe asap. I sent a text message to my Panget and told him that I was going to Gateway Mall. He happened to reply and say that he was in the office and offered to bring me home after buying my shoe in Gateway. So I took his offer, I dropped off my mom at home and on I went to GAteway. I left the house at about past 5:00pm and zoomed to Gateway - on the way there, I fell asleep! The next thing I knew, I was already on Aurora Boulevard turning right to get to Gateway! I looked at my phone for the time and it was nearing 6:00pm. Knowing that my Panget is in a bad mood and that he gets off work at 6:00pm - I took my time (hehe...) I went on to Celine to get my shoe, and I did - in under 5 minutes! Fast huh?! Well, I'm that kind of a shopper - if I see something I like I get it immediately, but this happens very rarely - as I am kinda tamad to go shopping - I have my moods. After Celine, I proceeded to Beauty Bar to purchase Foot Petals for my new shoes - unfortunately, it was out of stock!! Argh.. After this, I then decided to go to my Panget's office. First, I had to figure out which roads I will walk through to get to his office. His office is located in Aurora Boulevard, right in the heart of Cubao. Great, I remember watching on TV (Probe Team to be exact) when I was little that Cubao had a lot of darkness to it. There were the dark cinemas that stunk when you enter it because of some suspicious actions (I will never forget the phrase - masangsang ang amoy na sasalubong sayo), there were numerous clubs and a whole lot more. Nevetheless, I walked through Aurora Boulevard in a slow pace, appreciating the simple pleasures of walking since I didn't attend my Yoga class - it wasn't so bad! The only stinky thing about it was that there was pollution everywhere! Smoke Belching galore! Man, was it tough! It was blowing right into my face! Grr... I'm a law abiding citizen when it comes to crossing the street, and so I picked my spot and waited, and waited and waited until the police guy signaled for me to cross the street - before that I observed people were having their death wish- they were crossing from all sorts of directions, popping everywhere! With cars zooming passed them!! Yikes! Then off we went to Posh Nails. I've never been a fan of this establishment, the receptionist was always outside chatting away with some person, their staff was not as good - but hey, they were open until 10:00pm. We had to wait for 15 minutes because the nail technicians still had to finish what they were doing. I was lucky enough to get Bel as my technician, she had soft hands and was very maalaga. She massaged my feet and kept on asking if there was something painful (nice diba?) After putting on the nyde color on my toes - she suggested that I get a foot massage next time because I had so many lamig on my left sole. This gave my Panget an idea - he wanted to have foot massage. Seeing as it was only 10:30pm - he claimed it was still early. And so off we went to search for a place to get a decent foot massage. We ended up in Footloose on Tomas Morato, we got here by accident because my Panget was thinking of this place while I was referring to another place nearby. But since we were already there, we gave it a try. And the verdict? It was great! It's been so long since I last had a foot massage! My tired feet felt rejuvinized - I love the kneading action on my left sole. It felt so good!! Really really good. We finished at 11:30pm and as we exited the establishment, I was telling my Panget that it was night of pampering - pampering of the stomach (steak) and pampering of the feet (pedicures and foot massage) My Panget enjoyed it very much, that he hinted on having another go at this same routine (sans my walking in Cubao) next week. Last Saturday afternoon, I complete the 30-Day Challenge of Bikram Yoga Manila. FINALLY!! I've done it! Yehaaa!!! :) To celebrate my feat, I decided to take the Sunday off yoga, the bad thing was - my body was looking for it! I woke up in time for the 9:30am class but I told myself to go back to sleep, I tried but failed. 1) I get better sleep! Even if it's less that 8 hours, I still wake up each day with a smile! Every morning, it seems like I find myself more cheerful and each day seems so sun shiney to me! 3) I have no lower back pain at all! Bikram Yoga worked magic to my lowerback pain. I've had it since I forgot when and it's more painful when I have my period - and now - bye bye pain! 4) I've become more flexible - yes, this has been proven because from Day1 - I couldn't get my forehead to the floor - and now I can! 5) I'm more at peace (I think..) and a little more patient with everything else. The breathing really really helps..
6) So many new friends! Cristina, Jeanne and her mom Auntie Margie, Lorrie, Maan, Jenny, Tita Joy and Tita Anne, Auntie Cynthia and Auntie Annie, Anna, Bernie, Cris, Miguel, Auntie Rose and her daughter Candice, Stephanie and a whole lot more!! I just have to mention the wonderful staff of the QC studio - Tristan, Al, Alex and Gemel (did I get the spelling right?). So, do I take another 30-Day Challenge? Maybe next year, now I will just continue my practice and take it one day at a time. But to be honest, my body looks for Yoga. Is that a good thing or a bad thing? Bikram Yoga is definitely THE best exercise for me. I don't get bored doing the 26 postures because everyday is a different day, it will never be the same. You get to work out all your body parts and sweat like crazy in just 90 minutes. Amazing huh?! I just got back from my Bikram Yoga session. I needed to catch up because I took the 30-Day Challenge. Since there were 2 holidays (November 1 &2) plus another day because I got sick - I need to take 3 double days to make-up for lost time. Today was my first time to take the 8:30am class, since it was first thing in the morning - I didn't know what to expect. I knew for a fact that my body will still be stiff - but what the heck - I needed to do it. I was also told by Tristan that the hottest class were the morning classes - good thing the weather was quite gloomy - Nakikisama ang panahon sa akin. I reached the studio at about 8:15am, as I signed up for class I noticed that there were already about 6 people who's already signed up ahead of me! Most were women, there was only 1 guy who was with us. As I entered the locker room to deposit my things - I saw familiar faces, most were mothers - they had already brought their kids to school and this was their only free time. I admire these mothers, despite their busy schedule - they still had time for themselves. WOW right? I always thought that if and when I do get married - I'd be juggling a lot of things, a lot of responsibilities which means less time for myself, but these women are just inspiring. It only proves that if you will yourself, you can do it! 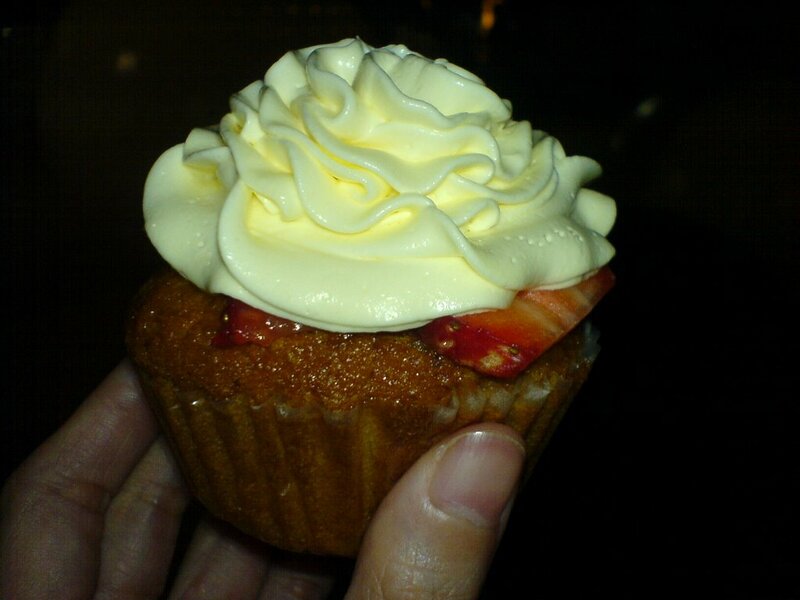 I have been craving for cupcakes since I last visited Cupcakes by Sonja after Market Man's eyeball. Christine suggested that I make my own concoction to suffice my craving - a good idea? - Brilliant! And so I searched the information super highway for recipes for a good cupcake. I searched and searched till it dawned on me that I was looking for the wrong kind of recipe. 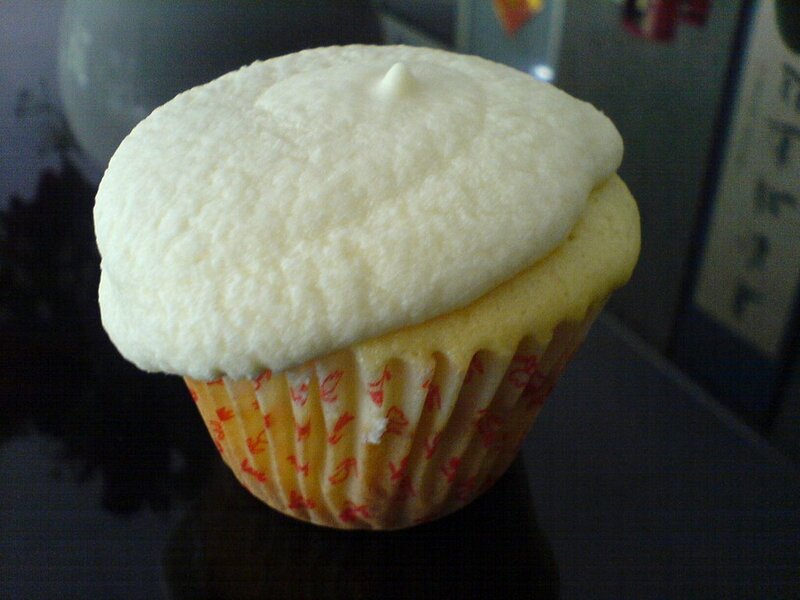 Since I was craving for Sonja's cupcakes - why not try and search for the Magnolia Bakery's original recipe! When I hit the search button - the results were alarming! There were numerous sites that were giving away the recipe, the famous bakery even had it's own cookbook for sale in Amazon! Thus - I copied 2 recipes. Both recipes asked for self-rising flour, what in the world is that and where will I find such? I sent an SMS to my good friend Jen and my Panget's sister-in-law. They both told me to make my own self-rising flour, since the recipe called for 1-1/2 cups self-rising flour I just needed to add 2-1/4 teaspon of baking powder and 3/4 teaspoon of salt. I started measuring for the ingredients after eating lunch. It was just then that I found out that I was missing an ingredient! I thought I had baking powder on hand - but it turned out to be baking soda! I had to ask the driver to buy me baking powder! Thank goodness the driver was there!! I followed the recipe to a T. And the result - well, I was disappointed. 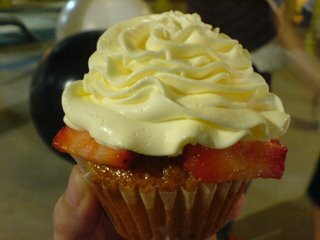 There was defintely something wrong with the cupcake (but I couldn't figure it out! ), it smelled and tasted too egg-y (for me), the frosting was too sweet too! My Panget on the otherhand was satisfied - but commented on the sweetness and that he wanted a cupcake with a more bite to it. I made another mistake - I know most bakers will make me sabunot for this - I put the frosting too early, while it hasn't been totally cooled yet - I have my reasons! My Panget wa s pressuring me to move faster! (he saw and watched me bake, for the first time.. Hehehe :) But seriously - I was too excited to tasted the whole thing. Next time, next attempt - I'll make sure it'll turn out to be better than this. I'll have to figure out a way to make the icing less sweet. - In a large bowl, on the medium speed of an electric mixer, cream the butter until smooth. Add the sugar gradually and beat until fluffy, about 3 minutes. Add the eggs, one at a time, beating well after each addition. Add the dry ingredients in three parts, alternating with the milk and vanila. With each addition, beat until the ingredients are incorporated but do not overbeat. using a rubber spatula, scrape down the batter in the bowl to make sure the ingredients are well blended. Carefully spoon the batter unto the cupcake liners, filling them about three-quarters full. Bake for 20-25 minutes, or until a cake tester inserted in the center of the cupcake comes our clean. - Cool the cupcakes in the tins for 15 minutes. Remove from the tins and cool completely on a wire rack before icing. At the bakery we ice the cupcakes with either Vanilla Buttercream or Chocolate Buttercream. - Place the butter in a large mixing bowl. Add 4 cups of the sugar and then the milk and vanilla. On the medium speed of an electric mixer, beat until smooth and creamy, about 3-5 minutes. Gradually add the remaining sugar, 1 cup at a time, beating well after each addition (about 2 minutes), until the icing is thick enough to be of good speading consistency. You may not need to add all of the sugar. If desired, add a few drops of coloring and mix thoroughly. Icing can be stored for up to 3 days in an airtight container for up to 3 days. Last night - was for the first time in years that I cooked my own pasta dinner. I have been so out of the cooking loop for a long loooong time now. And yesterday, when our fish/seafood man called to ask what we want to be delivered - I immediately thought of Clams/Halaan! And when it was delivered - I was quite shocked to see that they were huge! I was so used to the small clams that were served in restaurants. Nevertheless - I had the whole to day to plan what I wanted to with the clams. Make it into soup or a pasta dish? I searched the web for recipes - and I found 2 recipes from food tv. One's from Tyler Florence and the other was from Giada De Laurentiis. I couldn't decide which one I would use. I was looking at both of them the whole afternoon - tossing from one to the other. It was just after my yoga practice that I decided to go with Giada's recipe. I figured - Tyler's was the better choice - but I've never tried anything from Giada - and so I gave her a chance. I was secretly hoping that it would turn out good. And so when I got home at about 8:30 in the evening - I was preparing everything fast. The househelp was nice enough to have chopped the onions and set aside some already chopped garlic (thanks to the Black and Decker Handy Chopper Plus) near the stove. 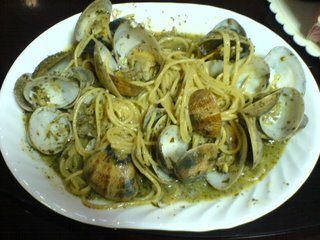 As I sauteed the onions and garlic, put in the clams and dry white wine - I was getting nervous that the clams were letting out too much water. As I put on the lid - I was praying that the sauce be enough, not too much and not too little! After a few minutes, I took off the lids and my suspicions were right - there was too much water. But the recipe said for me to add 2 tablespoons of diced unsalted butter, to thicken the sauce, and when I did - voila! The sauce thickened slightly. Yey! I then tossed in the al dente cooked spaghetti, a few seconds later - it was ready to eat. Since we were at The Fort last Saturday night - my friend Jen, my Panget and I went on ahead and took a look at the Serendra. I've been there before - but during the day. I had lunch there with Gracie a few weeks ago (or was it already a month ago?) Jen and my Panget wanted to see the Cupcakes by Sonja store. Since they've been hearing so many things about it - might as well see what the fuss is all about right? Good thing there weren't that many people. We were able to find parking instantly! We then headed down to the store. It was brightly lit - and full of people. Well, mainly because the store is not very big. When we entered the store, I immediately asked if they had Berries and Cream, this I was told was made of fresh strawberries, since I love strawberries - I had to give it a try. And so I did. I was lucky enough because they had only one piece left. Galing noh?! When Sonja Ocampo handed me the cupcake - she told me that if she put it in a box - it might get ruined, better that I eat it immediately. The first thing I noticed was the slices of strawberries hidden underneath the icing. The cupcake smelled wonderful! Absolutely divine! It was too pretty to eat! Jen and my Panget told me to take a bite - but I hesitated at first, but when I did - it was wonderful. On the way home, I held on the cupcake - I didn't want to take another bite because it smelled delicious - but in the end, I had to eat it all. One complaint though - the price is just too steep for a piece of cupcake. Imagine Php75.00 for a piece? Going out on a Saturday night may cause headaches - why? Well, simply because everybody in the Metro WANTS to be out. But nevertheless - my Panget, Jen and I weaved through EDSA just to get to Gourdo's at The Fort in time for dinner. It was a special occassion for Jen and I because FINALLY - we will be meeting Market Man. I have been a lurker of his blog and now I will be meeting him in the flesh, in the flesh! Most of you must be wondering - why I am excited at all?! Well, because in the local blog scene - Market Man is a celebrity, yes - he definitely is. I love his blog, I love his humor, I love reading his thoughts on just about anything. On the information super highway, it is a rarity that one can put a face to a handle(nick name) because everyone remains anonymous (unless of course if you're friends with that certain person). This month - I am celebrating my blog anniversary - it was just last year that I started blogging. So, what a way to celebrate my blog anniversary month with the Market Man eyeball, right? Sweet! I have never attended an eyeball - NEVER. I never had the reason and courage to do so anyway, but when I learned that Market Man was organizing one - I JUST HAD TO GO. It was a good thing that my good friend Jen, was just as game as I was! And so when we arrived at The Fort - Jenn and I were very excited, we were already looking forward to meeting fellow bloggers! (I just had to add that amidst the excitement, my Panget who is clueless on blogging was very supportive, mainly because he was looking forward to dinner and the dessert buffet! :) ) nearing Gourdo's we already spotted Joey, Katrina, and Anton. Joey and Katrina were already familiar to us because we had seen them at Lori of Dessert Comes First's Bakind demo, and as for Anton, well - I'm a big fan of his blog too! (Can you imagine how many lurkers/internet stalkers you have when you have a famous blog?!) Upon entering Gourdo's after registering - we were met by Market Man. Market Man in the flesh! Better - Market Man face-to-face, shaking our hands, welcoming us to the even and introducing us to The Kid and Mrs. Market Man. My my, here we are, finally - Finally!! I had to contain my excitement, I just had to. I was looking around and secretly spying on the name tags thinking that maybe I know some of these people - unfortunately, I didn't. I was looking all over for cutie Aidan, then I saw Rache - I went up to her and introduced myself! One down! The next thing I knew was that people started falling in line at the buffet table - and so we did too! The first thing that we saw on the buffet table was the table FULL of desserts - what caught my fancy was the dessert labled 'Goodness Gracious Great Balls of Goo' - it h ad such a unique name and the balls looked interesting!! But dessert had to wait, as we still had to eat dinner. We were served with the anti-pasti, how I love bruschetta! I particualry like the mushroom with truffle oil - YUM!! Then on to the main course - both the pastas were great! I loved the fresh pasta more than the red sauced penne, but what I loved more were the pizzas! I am definitely a pizza person, I had to go back for seconds!! The pugod roasted pork was also good. After munching and chatting - it was dessert time! I am a self-confessed SLOW eater - I somehow tend to talk more rather than eat, thus - Jen and my Panget went on ahead to gather and sample the dessert buffet. I know people will call me crazy and weird but - I absolutely HATE chocolates! You read it right - I do not fancy chocolates. It's something I never got to appreciate. I do like White Chocolates, but many will argue that it's not even 'real' chocolate. I don't even remember why I didn't like it in the first place, basta - I don't like it, period. My dislike for chocolates may be attributed to its color, but then again, maybe it's aroma, or it's taste? To make a negative become a positive, think of it this way - one less person who likes chocolates mean that one other person gets my share! Fair enough? Fair - well, because Jen and my Panget got my share! When they got back from the buffet table - all I could see was that everything on their plates had chocolates on them! Chocolate cakes, chocolate cupcakes, chocolate everything else! 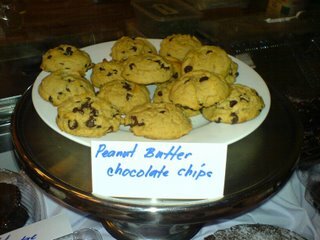 I was getting dismayed but still greatful because I saw that there was Peanut Butter Choco Chip Cookies (yes, I had to disect the cookie to rid it of the choco chips - I loved the consistency of the cookie!! Yum-meee!) There was this brazo de mercedes with crust - at first I hesistated but then - I got a small piece and boom - I fell in love with it. It tasted divine! To think that I am not a fan of Brazo de Mercedes! Then just before I left the buffet table - I saw it - Dulcelin's Mango Torte. My oh my - I had to get a piece for my Panget - he just adores this mango torte, and so I sliced a piece good enough for the both of us. When I got back to our table, the dessert plates of Jen and my Panget were almost empty - they told me in unison that EVERYTHING THEY GOT TASTED GREAT!! Such a compliment right? Definitely! I never heard anyone utter a negative criticism on the desserts! All I could hear was 'Ang Sarap!' 'Who brought this? 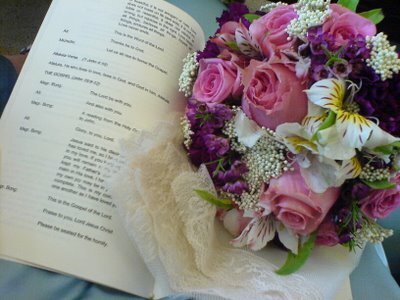 I love it!' Nice huh!? Lumpia: a small fried eggroll filled with veggies and/or meat. I am super excited for tomorrow night's buffet dinner at Gourdo's! Finally, I will be meeting Market Man face-to-face. I have been a lurker of his blog for the past six months and I must say, I love his blog - I visit it almost everyday(actually, everyday..) - hoping that when I click on his link - I will be reading a new entry. At the same time, I will be able to put faces with the names of the other blogs that I frequent. When I read that MM was entertaining thoughts of having a 2nd EB - I was delighted. I immediately sent an SMS to my good friend Jen (who I miss by the way...) asking her I she was game, to be honest - I don't think I need to ask! She was deinitely game. Great! The plan is now close to perect! One thing left to do - and that is to convince my Panget to attend with me. I had to think of something, something great and unique - to try convince him to come with me. 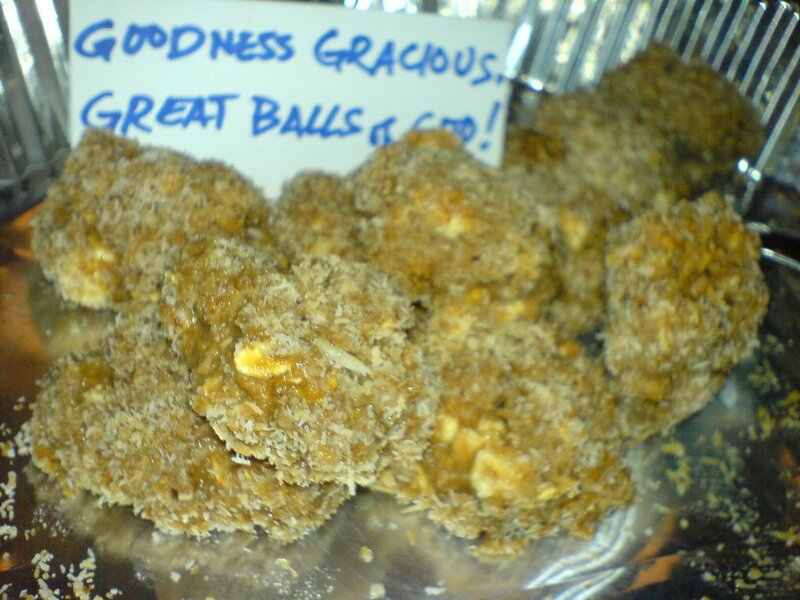 Good thing, the EB asked for the attendees to bring desserts - a dessert buffet. And so I told my Panget that Jen and I are going to attend a 'dessert buffet' organized by Market Man. 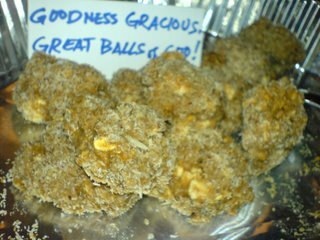 Of course, when my Panget hears the word dessert - it clouds his judgement, thus - the perfect time to invite/manipulate him! And I was successful! I couldn't believe it at first, but I was able to convince him to join Jen and I. Yipee!! Finally! I've decided to watch this show. Finally!! I've been told a dozen times by different people that this show is gooooood. But I never got myself to watch this show - why? I don't really know. I've never been fascinated with medical dramas. Anyhoo, the verdict? Well, I'm not as obsessed with it as I am with Lost or Prison Break - but, I LIKE it. I've been trying my best not to sleep on the wee hours just to finish the episodes, but looks like - I will be. It's not addicting but it's fascinating. Maybe I'm speaking too soon! One thing I liked about the show is how they humanized the characters (duh?!) Doctors pala have emotions too. (I know?!) They're not just machines/robots (as I assume them to be) who react when given a stimuli. I was touched and naawa in a couple of episodes. The show brings a different flavor and taste to the table. Why not, diba?! P.S. Meredith Grey looks so young! Unbelievable! I thought she was just in her 20's - but she's actually 37! !